Consulting firm Deloitte presented the Technology Fast 50 Awards in Munich yesterday, to leading companies in the technology sector. The award winners share similar characteristics as being proprietary technology vendors with impressive growth rates measured across the past four financial years. A celebration of success: rexx systems was again awarded the prize at the ceremony for the Deloitte Fast 50 Awards in Munich. While many companies usually only appear once in the list of winners, rexx systems has become a regular guest. After first winning the prize in 2011, rexx systems has gone on to win it again in 2012 and 2016. And now in 2017, the Hamburg-based company is again a winner of the "Technology Fast 50" award by Deloitte – meaning back-to-back success and the fourth time we’ve been awarded this recognition. The renewed place among the 50 fastest-growing technology companies once again underscores the enormous innovative power of rexx systems Talent Management platform. "With now over 1,000 installations in more than 20 countries worldwide, the message is spreading. Rexx systems is being recognised as one of the leading providers of human resources and talent management solutions. We are still one of the tech growth drivers demonstrating sustainability, and are proud to continue to develop market leading HR solutions and services" explains Stefan Daufenbach, Associate Director of rexx systems. rexx systems is a leading provider of innovative solutions for talent management, e-recruiting and human resources management with headquarters in Hamburg and locations in Austria and Switzerland. rexx systems improves the daily work for HR, executives and employees in over 1,000 companies and for hundreds of thousands of users. Our goal is the comprehensive support of companies for all topics relating to human resources through a constantly optimized solution platform known as the rexx suite. rexx systems sees itself as a solutions provider - from consulting to implementation to operation. Many customers rely on the cloud offering, where the rexx platform operates in high-security data centers in Germany. But we also understand that not all companies can readily embrace the cloud, which is why we provide and support the same platform and feature set as an ‘on premise’ solution for customers to operate on their own servers ‘in-house’. The winners of the Technology Fast 50 Award are based on new technologies and are the fastest growing companies in the IT, communications and life science sectors. With the Technology Fast 50 awards, Deloitte honours entrepreneurial excellence every year. The competition was launched in the US in 1995 and has since developed into an international initiative. The awards in 2017 mark the fourteenth time the Technology Fast 50 has taken place in Germany. 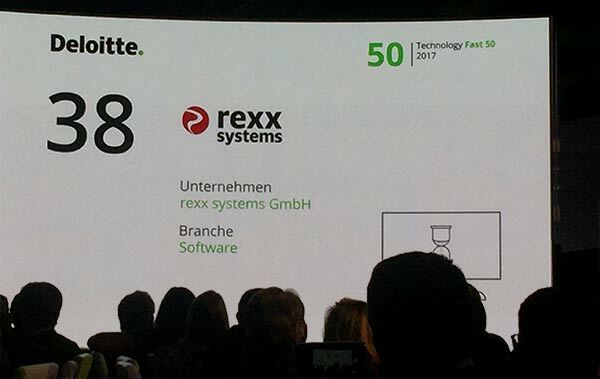 rexx systems was honoured for the fourth time as one of the 50 fastest-growing technology companies in Germany.